One thing about using iPhone is the lure to always snap pictures in order to share them with your loved ones. In the process of doing this, these photos start taking up too much storage space and your storage space becomes full. Do not forget that lack of storage space on your device has its own negative effect and that is why it is important to delete photos on your iPhone to free up storage space. Part 2: How to Check If Your Deleted iPhone Photos are Still There? Part 3: What to Do If You Have Found out that Deleted Photos Still There? Photos deleted from iPhone does not mean that the photos are gone, note that they are still existing on your device just that you may not be seeing it. Since they still exist on your iPhone, it means that they can be easily recovered and the implication is that it could lead to a privacy leak which is not desirable. It does not really matter if you have removed a recent album; there is a high possibility that the photos can still be recovered. This is why you need a good tool to delete your photos on your iPhone. Like said earlier, casually deleting your photos on iPhone does not in any way ensure that they have been erased, they could still be on your iPhone. However, if you have already deleted these photos, there is a way to check if these photos are still there and it is free. Step 1: Connect your iPhone to iMyFone Umate Pro or iMyFone Umate Pro for Mac. Step 2: Choose “Erase Deleted Files” mode. Step 3: Scan your iPhone for free. The Umate Pro freely scans your iPhone and shows you the files you have already deleted on your device. 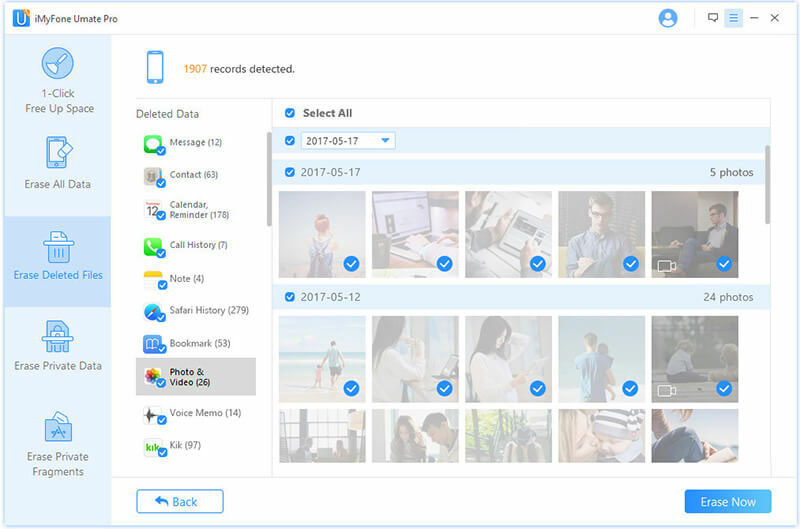 If after deleted your photos by casual method and you find out that they are still present on your iPhone, it is advisable to permanently delete photos from iPhone using the Umate Pro. The “Erase Deleted Files” mode will fish out deleted files then you can select deleted iPhone photos and erase them permanently. With this method, other sensitive files can also be erased off your iPhone. Permanent Erase: Guarantees that your data is permanently erased that they can never be recovered. Selective Erase: Have the choice of erasing what you want to erase, the option is yours. Erase Previously Deleted Files: Cover the trace of deleted files and make it untraceable. Erase All Data: Few clicks to erase everything if you intend to sell off the device or give it up as a donation. Erase Third Party App Data: Erase third party app photos/fragments from Snapchat, Kik, Wechat, WhatsApp, etc. Erasing your iPhone private files will lead to privacy breach especially from data criminals who could use it to defraud or harm you. It is important to note that erasing your data permanently means you are not doing it through a casual means else it can be recovered with data recovery software. With tools like the Umate Pro, you can be rest assured that your private data will be permanently erased.